17 WAS (NYG) W 18-10 14 3 4.7 8 0 No injury listed. 16 @ ARI (NYG) L 0-23 0 0 0 0 0 No injury listed. 15 PHI (NYG) L 29-34 15 5 3.0 17 0 No injury listed. 14 DAL (NYG) L 10-30 23 6 3.8 9 0 No injury listed. 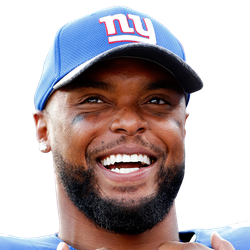 13 @ OAK (NYG) L 17-24 -3 1 -3.0 -3 0 No injury listed. 12 @ WAS (NYG) L 10-20 18 3 6.0 11 0 No injury listed. 11 KC (NYG) W 12-9 13 2 6.5 12 0 No injury listed. 10 @ SF (NYG) L 21-31 11 5 2.2 6 0 No injury listed. 9 LAR (NYG) L 17-51 0 0 0 0 0 No injury listed. 7 SEA (NYG) L 7-24 4 2 2.0 6 0 No injury listed. 6 @ DEN (NYG) W 23-10 4 1 4.0 4 0 No injury listed. 5 LAC (NYG) L 22-27 18 5 3.6 5 0 No injury listed. 4 @ TB (NYG) L 23-25 14 5 2.8 7 0 No injury listed. 3 @ PHI (NYG) L 24-27 5 1 5.0 5 0 No injury listed. 2 DET (NYG) L 10-24 28 6 4.7 8 0 No injury listed. 1 @ DAL (NYG) L 3-19 0 0 0 0 0 No injury listed.